After a month and a half travelling along the East Coast, we finally reach one of the most popular destinations in Queensland: Cairns. Cairns was founded in 1876 in an area inhabited by Yidindji people, a group of indigenous people of Australia. Since then, it has grown more and more mainly due to the production of sugar cane. Its economy is currently driven by the tourism thanks to the well-known Great Barrier Reef. The city can also offer a variety of activities: taking a walk at the Esplanade(2km), where you can even practise free sports lessons, enjoying the beautiful saltwater pool of the Lagoon or visiting the tropical fruit market on Sunday morning. Don’t miss out the daily market of Kuranda, a typical village located in the middle of the Rainforest, only half an hour drive north of Cairns. Here you will find every kind of local aboriginal food, music and handicraft in a wonderful hippie context. Simply lovely! 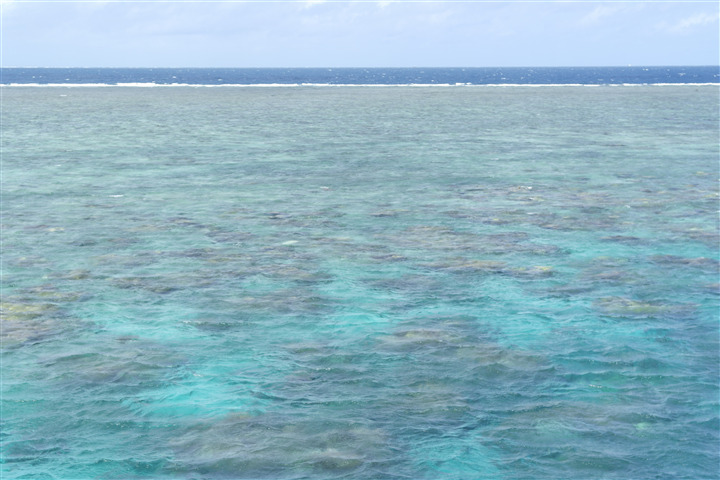 A must-do in Cairns is, therefore, a visit to the Great Barrier Reef, the largest in the world! The latter is composed of more than 6,600 species of flora and fauna, including 1,500 species of fish, 4,000 species of molluscs and 400 types of coral; and if you are lucky, you can even dive with turtles and small harmless sharks. We buy the tour from "Down Under" company for $ 175. It includes 2 stops to snorkel in the "outer reef" (where you can find more variety of fish and corals thanks to its sharper waters coming from the ocean) and lunch on board of the boat that carried about 80 people. It’s also possible to purchase other kinds of activities such as a helicopter ride over the barrier reef or a diving experience, obviously more expensive and so above our budget. Moreover, Cairns is the major access point to the Daintree National Park - UNESCO World Heritage - only 2 hours far by car. This rainforest houses the largest species of plants and animals on earth including a rare species of tree kangaroos and the quite dangerous cassowary. We start the road trip from Cairns and, once in Palm Cove, it’s possible to enjoy the breath-taking view of the ocean, where the lush rainforest blends with the blue sea. We stop then in Port Douglas, a tourist but really picturesque small town, which offers a wide choice of bars and restaurants along with an amazing view from the promontory called "Island Point” or “Flagstaff Hill". The following day we keep driving towards Mossman where you have to catch a ferry ($ 26 per vehicle) in order to cross the Daintree River - one of the longest rivers on the eastern coast of Australia (140km). After an hour and a half drive in the beautiful forest, we finally reach Cape Tribulation beach characterized by stunning mangroves but also by poisonous jellyfish typical of these areas; moreover, after a short walk of 600m, you can enjoy a very nice view from above where you can really realize the vastness of the forest. On the way back, we can’t skip the ice cream factory “Daintree Icecream Company” where we taste the 4 fruit flavours of the day for $ 6.50: a delicious and natural ice cream that you must try! Then we spend the rest of the day at "Cow Bay", a beautiful and peaceful beach where to relax and enjoy the fairy-tale landscape! We come back to Port Douglas in the late evening and we stop at the free barbecue for our favourite dinner under the sky and just next to the ocean! Definitely a landscape completely different from those encountered so far. An area rich of colours and traditions typical of the local population. This trip brings us back to another era in which aborigines dominate and live in harmony with the wild nature.